A hoist uses mechanical advantage to do the heavy lifting it does. 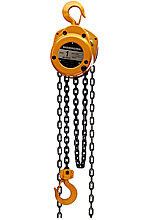 This mechanical advantage (or lift) happens when a chain is wrapped around a movable drum attached to a shaft which turns gears that move the lift chain incrementally to the distance the pull chain is moved. This exchange of distance for force allows one to lift tremendous weight with little effort. The image to the right shows the placement of reduction, lift chain, lock ratchet and pull chain gears. 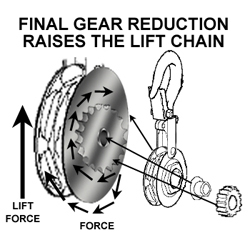 As the load is lifted, the lock ratchet gear locks in place, preventing the load from dropping back down. 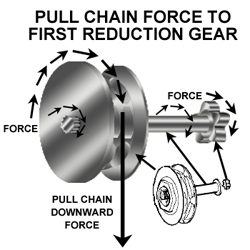 In this view, we see that as the chain is pulled downward (input force), the chain gear drives a spindle that turns a reduction gear on the opposite end. This small gear drives two larger gears which take the input force and converts it to lift strength. 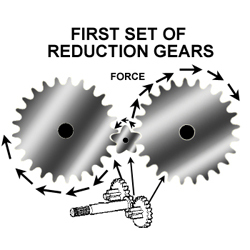 On the reverse side of the large gears, there are smaller gears to transfer input force further along. 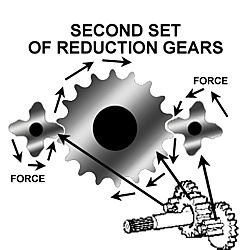 These small four-sprocket gears turn the final reduction gear, completing the conversion of pull distance (input force) to lift strength (output force). 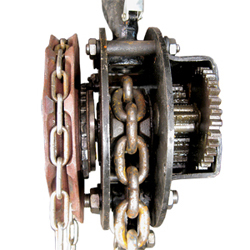 This final reduction gear is connected to the lift chain housing and rotates the lift chain, raising the load attached at the end of the chain.